Twilight came in time for the finale. Key West clouds were cloaked in velvety blue. The crowd swelled to 100 people. After dousing a metal hoop with a bottle of Publix lighter fluid, the Catman asked the audience for a match. "Hurry up! Take your time!" he called as a middle-aged man rushed forward with a white plastic Bic. The Catman lit the wire and tossed the Bic back quickly, yelling, "Go back to your seat!" Flames flickered along the hoop, which was otherwise invisible in the new night. The Catman poked his head through it. Eerie shadows danced across his face. He removed the burning hoop and held it high. In his thick French accent, he coaxed a cat to jump through the fire. "You can do eet," he told the tortoise-colored feline. "Eet's all in your mieend!" As if hipnotized, the cat froze. "You're OK," the Catman reassured him. He explained that the cat, named Mandarin, came to him as a stray after Hurricane Georges. Suddenly, Mandarin leapt from his perch with such force, he nearly knocked it over, sailing through the flames to an identical pedestal on the other side. In that moment Mandarin was not a cat but a blur on the horizon, a bright star shooting across the sky. The crowd erupted in applause. "That's amazing!" someone gasped. "Thank you the hurricane!" he cried. The Catman seemed to come to me in a dream, like fog of the Carl Sandburg poem, on little cat feet. Reality is rare so poetic, though, and in fact the Catman came by word of mouth. I dreamed of seeing him for real. I learned of the Catman through my friend Erin. He's bizarre," she gushed. When Erin gets excited, she slips into a Southern drawl, stretchin out her vowels lake taffy. "He's just so weird." A native Alabamian, Erin has a healthy appreciation for eccentricity. 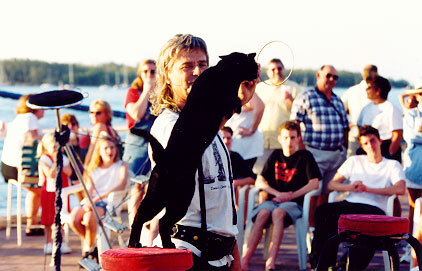 She has been visiting Key West for years, since the days when the Catman performed in Mallory Square. These days the Catman can be found in the rosy glow of nearly every sunset at the Hilton Key West Resort and Marina pier, exhorting his house cats to leap great distances in a single bound, walk a tightrope, even, yes, jump through flaming hoops. While these feats are extraordinary, it is his words that linger long after the show. Erin and her family returned to Fort Lauderdale repeating the Catman's irresistible, French-fried phrases. Soon those of us who had never even seen the Catman began to mimic him, too: "You can do eet," we cried in unison. "Eet's all in your mieend!" Would that it were true. The truth is, I am not exactly a cat person. I'll take a wet dog nose against the palm of my hand over the mewing aloofness of a shedding feline any day. It wasn't cats that drew me to Key West on a partly rainy, partly sunny Friday afternoon in early October. It was the man. The Catman is touched, improbably, by the kind of fame that spreads suddenly and unexpectedly. When one is so delighted by a person or an idea, she feels compelled to share. There is no accounting for this sort of phenomenon; it can't be planned or bought. Erin and her brother, Patrick, are crazy for the Catman, and her family is hardly alone.The Catman is a cult hero, drawing audiences from allover the country and the world to Key West and commanding radio and television appearances on networks foreign and domestic. Sadly most of these stories fail to capture his true appeal. The shows and articles debate cats' propensity for tricks, consulting veterinarians and experts and interviewing animal trainers for tips: What they miss in all this kitty-centricity is the Catman's oddly liberating existentialist bent. It is psychology, not Whiskas, with which the Catman urges his felines through rings of fire. "There is no flame," he tells them, "only on your mind!" The idea of writing about the Catman came to my mind in another season. It was mid-August, still relentlessly sunny, still summertime. I was standing waist deep in a pool with Erin and our friend, Stephanie, preparing to swim as far as I could underwater. As I sucked in my breath, they cheered, "You can do eet! Eet's all in your mieend!" We never tire of this line. For the umpteenth time, Erin urged me to do a story on the Catman. Then, under a blue sky reflected by a glimmering aquamarine pool, a beach ball's throw from the shimmering Intracoastal, it sounded, at last, like an idea that would float. Now that day feels hopelessly long ago. I don't want to begin with an ending, but in the before-and-afterness of September 11, flying house cats seem irredeemably frivolous. What was the point? Maybe, I thought, the answer could be found at the end of the road, on the tip of the continent. Things are different there. I pick up Stephanie in my rented Suzuki Grand Vitara, and we begin our journey, cruising down Interstate 95 until it becomes U.S. 1. The road takes us low. In Homestead flimsy prefab housing tracts sprawl like cats in the sun. It's a whjle before we even reach the southern edge of Miami-Dade County, much less drive the 189.7 miles to Key West. At sea level, wind whips the landscape, blowing ubiquitous American flags nearly to shreds. We are all vulnerable, I think, as a gust nudges the Suzuki from its lane: hurricane bait. Oscar jumping through a tiny ring! I overhear a man in the hotel swimming pool say he came to Key West for a wedding; he's getting married at the celebrated moment of sunset. It doesn't occur to me that his nuptials could interfere with my own raison for visiting. It isn't until later, when I notice rows of black and gold chairs arranged on the pier, that I begin to worry. I phone the Catman, but he doesn't answer. I dial the concierge. Surely he will know if the Catman has moved or canceled his show. After all, the Catman is pictured in the Hilton Key West brochure in front of a vibrant sunset, smiling and holding a ring of fire while a tabby leaps through the hoop. The concierge is no use. Anxiously l wait until late afternoon, then set out for Mallory Square. I know the Catman arrives about an hour and a half early to set up his show. I think maybe he will return to his former venue. The air is thick and stiflingly hot. Whirling ceiling fans seem not to cool but rather to induce vertigo. I feel sick to my stomach; maybe it was the conch. Summoning my strength, I approach two men sitting on a brick step. "Have you seen the Catman?" I ask. "The Catman. The man with all the cats," I snap, exasperated. They glance at my reporter's notebook and stare at me like I'm from another planet. Finally the men shake their heads no. It's Conch logic, of course: Of all the freaks and exhibitionists that populate the island, I, with my notebook and Catman quest, am the crazy one. Standing at land's end, I look out on the harbor to the bright-blue "Gulf of Mexico. Overhead, wind whips the Florida state flag, the American flag, and the cobalt-colored flag of the Conch Republic. I wonder if the Catman, who was born in France, considers himself and his cats Conchs. Then I worry that I might never know. Turning back to the street, I hear a glorious sound: my cell phone. The Catman says he will be performing at the Hilton pier after all. I tell him I'll meet him there. OK. Byee, Ameee!" he says brightly. Though small in stature (about 5-foot-6), Dominique LeFort, a.k.a. 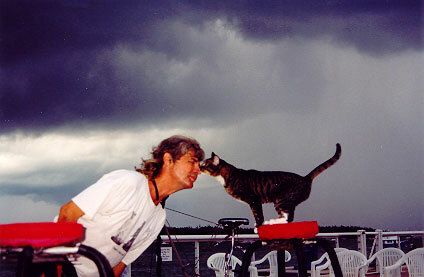 the Catman of Key West, is hard to miss. when he buzzes up on his purple scooter, his silvery, Gallic mullet flying behind him like a banner in the breeze, he has a certain je ne sais quai, not to mention a cargo of surprisingly quiet cats. The lilac-colored plastic cat carrier and a wicker basket strapped to the back of his scooter contain three cats each. Two cats, he reports happily, sit in a gray carrier at his feet. Dominique motors his cats -Piggy, Sharky, Oscar, Sara, Cosette, Chopin, Mandarin, and George - into the Hilton's cool, cave-Iike storage space, which calls to mind the dingy back- room of a department store. Catering carts are pushed against the walls; a makeshift break room is set up in the corner. Dominique hurriedly wheels out his props, an elaborate set of metal stands with steps, tightropes, and padded pedestals that he designed nine years ago and had welded together by a local shop. He's designing new ones now, for his new-and-improved show. "I like to design," he says simply. "I like that." He designed his brochure, too, a tri-fold pamphlet used to order his T -shirts and videos, but unfortunately, the section with the picture of Mars (who has since been lost) jumping through hoops is the part that was to be torn off and mailed away. "That's the part everyone wants to keep," he complains. "The printer is in Miami," he said with a shrug. "What can you do?" Then, inexplicably, Dominique bursts into laughter. An animated man, he laughs frequently and heartily, usually at himself. It's a gesture that seems to say, " C'est la vie." He rolls another prop outside. Sun glints off the metal tubes. "Where the technicalities end," he calls over his shoulder "the art starts." There are plenty of technicalities. Even before he arrives at the Hilton, Dominique, who has been performing in Key West since 1984, has already begun to ready himself. His schedule is built around his show, which he performs nearly every day. show time is at 6:30 p.m., in "one minute plus one minute minus two, and we're never on time!" He takes time off for the rainy season and sometimes, he adds, "when I am lazy, like the cats." Before each performance he, uh, catnaps for an hour or so: "I have to prepare in my mind." Likewise, Dorninique requires a certain amount of time with his felines, not merely for his own good or for the cats' but also for the quality of the performance. He spends at least half an hour with them after each show, then watches TV, reads, or plays on the Internet before going to bed. Sometimes he would like to go out, maybe to a bar on Duval Street, but often his 58-year-old body protests. "I don't have the stamina." Besides, he says, the cats come first. "They don't like to be left alone, We have to socialize, to be a team. Because if I only see them for the show, it would not be good. You'll see the interaction during the show between them and me;" He smiles and nods his head. 'you'll see." Indeed Dominique says his mental state sets the tone for the show. The cats can tell if he is tired, sad, or anxious, "They rely on me a lot," he adds. "If the boats, if the shoot the cannons, the cats look at me, see how I react. If I stay still, they stay still." They are affected by things humans cannot see. During sunset, for example, the cats sniff the air. Dominique has a theory on this: "I'm sure it has something to do with the magnetic field or something." He lives alone, though to him it doesn't feel that way, because he shares a large RV with his cats. "It's like one big room, so everyone is together. '; Dominique's motor home also serves as his office and, when he travels to performances, his tour coach. "I used to travel more," he says, "but now people know I am here." The cats must miss life on the road. They love to sit on the dashboard, on his lap, and around his neck and watch the scenery as he drives. Last month Dominique drove them all to a performance in White Plains, New York. "When I hit the ignition, they are happy." The cats more or less have the run of the RV, with the exception of the table and countertops ("I think it's not hygienic"). when they disobey he glares at them ferociously and pounces, like a cat, to intimidate them. "It's not a sin to tease a cat," he reasons. "They are great teasers themselves." Dominique does not seek to domesticate his pets. He feeds them different kinds and amounts of food to mimic the inconsistent diet they would have in the wild. Some of them are somewhat wild, feral feline orphans he has adopted over the years. Or rather, the cats have adopted him. "You cannot choose a cat," he likes to say. "They choose you. When you rescue a cat, he's yours forever." He found Sara at a rest stop outside Atlanta, a fact he often uses in his act. "I like her, she liked me," he says in a sing- song voice, "and we fell in love." Sara is a particularly sensitive cat, so about once a month or so, Dominique locks the other cats in the bathroom and spends some time alone with her "So she feels I love her." He wants to add musique to his act, he said, "because Sara is very expressive." Still, Dominique insists, he doesn't have a favorite among his pride. "They know I love them each for different reasons." At this he turns tow heel out the last of his gear. It's almost showtime. He moves toward the door, and finally I blurt out the question I've been holding back: I wonder aloud if his cats are family to him. He pauses for a moment and looks serious I begin to worry that somehow I have offended him. l know he has family: a daughter the same age as I am who lives in Los Angeles,. a brilliant student named Vanessa, who lived with him until age 11, and whom he put through UCLA, where, she earned a degree in math and physics with the money he made with his cats. To my relief the moment passes as he shakes his head in vigorous affirmation. "Oh, yeah," he says emphatically, then , hurries out with the last of his gear. As he walks past, I notice he is still shaking his head, eyebrows arched over his pale blue eyes as if to say, "You have no idea." When Dominique held his first cat show more than 25 years ago, in a high school gymnasium in Montreal, the cat, Chaton, panicked and ran away. Still, he persisted. 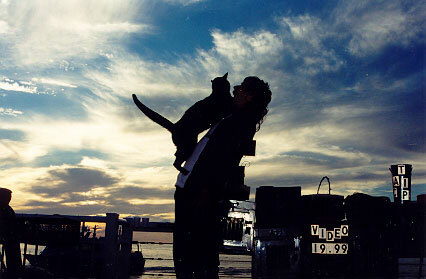 He got more cats and trained them, performed in Las Vegas and Orlando, then came to Key West. Last year he started putting down what he's learned in a book. "The feline psyche is very interesting. They live in the present, and they like to be comfortable." More importantly, perhaps, "They understand velocite," he says, pronouncing the word in French and spinning his arm in circles to demonstrate. "The fastest one gets the prey." Dominique is the same way. "Me, I like fast," he says. "When was in Paris, I don't like to walk. You know. in the subway? I like to run. I like that," he says, smiling, relishing the thought, "velocite." "They can read your mind very well," he adds. This, he explains, is not ESP but evolutionary. "If they go after the prey, they have to read the mind of the prey." Cats are not without empathy, however. "Well, they help you," Dominique says softly. "When you feel weak or tired, they come to you to comfort you, It's interesting, really. When they realize you are down or stressed, it's amazing: They pick it up and comfort you. "They are more for individuality. They are unique. They do not follow anyone. If people like dogs, they like to follow a leader. But a cat doesn't need to follow to feel strong. Some people are like this," He continues a quasipoliticaI ramble that seems to follow a single thesis: "On the planet, if people were more independent, we'd have less problems." In other words, things would be better if people were more like cats. On his Website, www.catmankeywest.com, Dominique refers to his show as "Dominique's Circus Cats." The name is ironic. Part of the singular appeal of the performance is that it is far from the greatest show on earth. With a Saturday wedding in full swing yards away, Dominique's show seems, by I contrast, to take a tone of irreverence. The pinging of steel drums mingles with a recording of Pachelbel's Canon. Wed ding attendees wander by, unwittingly crossing the border between holy matrimony and something else entirely. One of the most entertaining things for a veteran Catman audience member is to turn away from the show and watch others seeing it for the first time. It is a Rorschach test. Some people are baffled, others amused. Dominique's cats are in control, and often they make a fool of him. "Do something," he pleads, "I look stupide over here!" Dominique is always clowning around. Part of being a clown, he explains, is humbling yourself before the audience. They laugh at you, not with you, and in the process elevate themselves. This, he says, is why clowns hold a special appeal for children. Sometimes he puts red tissue paper in an embroidery hoop and has his cats jump through it, parodying his ring-of-fire trick. Even then, a lot of people look nonplussed. When several groomsmen pause to watch the show, they freely, holding cans of Budweiser aloft as they stare In disbelief. "This guy is crazy," somebody mutters. Maybe they are dog lovers... or drunk... or both. In any case Dominique calls it a "cat show for cat people," but of course it's more than that. The show combines several techniques he has studied in Paris and perfected for decades, including pantomime, clowning, improvisation, and drama. His performance is not simply antics but theater. It is structured, with oddball lines written in like the dialogue of an absurd play. When introducing Oscar, for example, he says the cat was born to a jungle cat mother. "She was Wilde," he quips. Many, if not most, miss his puns and double entendres; I am no exception. When Dominique tells me this, it seems to make his performances poignant, I'd thought I heard some tourists mock him and then remember that even Erin, an avid and longstanding Catman fan, had told me she'd seen one show in which no one, laughed at all, save for Dominique himself. Dominique says, though, that some- L times audience me:mbers come over, look him in the eye, and say they catch what I others miss. And anyway, his more obvious lines, like "Whoo I am getting excited!" and "Stay where you are!" are so popular that even other Key West performers have copied them. This angers Dominique as much as it flatters him, but he chides them gently, saying he will expect royalties. "Most of them," he says with a sympathetic sigh, "they don't have much imagination." 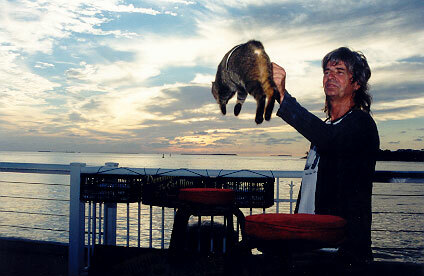 I came to Key West to get at the root of my fascination with the Catman. When I returned I was told to put the Catman phenomenon in the context of All That Has Happened. It seemed a bit forced to me, but I dutifully if grudgingly, included a September 11 reference early in the story. (Perhaps you remember.) At this point my editor tells me I should revisit that theme, shift the tone from whimsical to wistful. Or as he put it, "Pump up the wistful part." A meaningful conclusion would've been the perfect souvenir. The word is taken from the French and means "token of remembrance." It seems too delicate a phrase for the airbrushed shells, toe rings, and especially, Osama bin Laden T-shirts sold on Duval Street. How could we ever forget? I couldn't find the souvenir answer my editor expected, but I did buy a couple of post cards, and I sent them. It's an old-fashioned habit but maybe an apt one, even the awkward acknowledgment that the reader should be present but isn't: "Wish you were here." After all, sometimes the place really does look like the photo -sometimes even better. And what could be truer than a handwritten synopsis of a day spent far away in a time that will never exist again? In the end, the stories we write, save, and mail to friends, no matter how brief or feeble or trite, are our best effort at remembrance, souvenirs in the truest sense. The night is extraordinarily humid. By the end of his two shows, Dominique LeFort's white shirt clings to him, drenched with sweat. Audience members linger long after even the other performers have packed up and left. The steel drums are silent, the mosquitoes are biting, and the wedding party has left for an indoor reception. The only receiving line that remains is for Dominique. As usual a few cat-fancier fans have stuck around: fortyish women cooing lovingly at the cats while others buy post cards and T-shirts. Dominique hanks them all graciously. A boy about nine years of age idly plays with the locks on the cages, but the child's angry father interrupts him. "Nicholas," the man bellows, "we're going now!" A married couple who look to be in their late forties hang back anxiously, waiting politely for their chance to talk to Dominique. Dan and Sylvia came to Key West from Fort Mitchell, Kentucky, and figure that over the years they have seen the show at least 15 times. Still, they are overjoyed to watch it again. "It's the best show you'll ever see," Dan tells me. When the crowd finally subsides, the two shyly approach Dominique. He recognizes the couple instantly, greets them warmly, and apologizes for his appearance. "You see me perspiring because I sent them lots of vibes," he declares. Cat owners themselves, Dan and Sylvia seem to understand completely. "It's very mental," Sylvia observes, beaming. "It's like a vibe," Dan adds knowingly, "a vibe coming from your soul;"